There’s a reason the Cougar has been at the top of the industry in America for the last several years. The Half-Ton travel trailer is a prime example of the levels of quality, livability, and functionality consumers have come to expect from this manufacturer. With creative floor plans, exceptional attention to detail, and an all-around well-constructed trailer, this model is a great choice – tour the country in style on your next adventure in the Cougar Half-Ton travel trailer. The Half-Ton has a stainless steel microwave oven, stainless steel oversized kitchen sink with cover, oversized drawers for pots and pans, solid surface countertops, eight-cubic-foot refrigerator, steel ball bearing drawer guides, a king bed, hand-glazed hardwood cabinet doors throughout, a fireplace (most floor plans), LED lights, pleated privacy shades, residential shower/tub, a toilet with foot pedal flush, an LCD television, a 12 V charging station, a gas/electric water heater, and a 12 V CD/DVD entertainment system with Bluetooth. To maximize safety, this trailer has a carbon monoxide detector, LP sensor, fire extinguisher, smoke detector, spare tire with carrier, and a manual backup on all main slide-outs. These are on top of standard safety features, including the black trim safety glass windows, backup camera prep, main entrance step light, fully heated and enclosed underbelly, enclosed dump valves, LP quick connect, and much more. 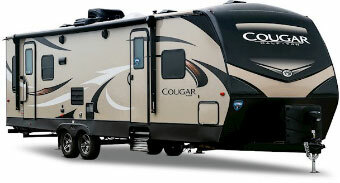 You’ll feel well protected inside the Cougar Half-Ton travel trailer. Built with sturdy aluminum and optimal engineering techniques, you won’t have to worry about functionality or performance. You’ll have a one-piece seamless TPO roof, aluminum entry steps, extra-large folding grab handle, electric awning with LED lights, five-inch fabricated stamped steel roof trusses, vaulted interior ceiling, black tank flush, laminated Filon sidewalls, outside shower, solar prep, rock guard protection on the front cap – the list of features is almost endless. You and your family deserve to enjoy supreme comfort, security, and peace of mind. The Half-Ton delivers these traits and much more. From its strong aluminum frame to its long list of interior features, there’s nothing this travel trailer won’t deliver. Come see one at Rich & Sons RV Headquarters today!